The ONLY Complete Audio Shakespeare Pronunciation Dictionary available, with over 5000 words. Audio Shakespeare Pronunciation App is a new and unique mobile app for actors, directors, students, professors, theater arts classes or anyone who studies the works of William Shakespeare. With over 5000 researched and recorded words. Available for iPhone and Android. Louis is co-author with Shane Ann Younts of “All the Words on Stage, A Complete Pronunciation Dictionary for the Plays of William Shakespeare”. 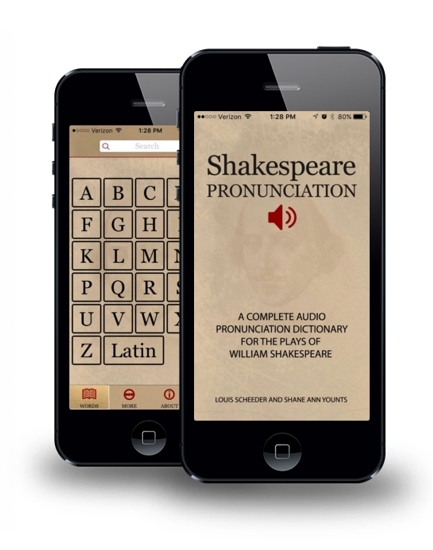 This invaluable tool has been crafted into an audio app, Audio Shakespeare Pronunciation App, that makes hearing the pronunciations all the easier and practical. Shakespeare has always been a challenge for actors, students, and theater artists. Louis and Shane Ann hope that this work will contribute to the growing interest in and increasing emphasis on the complexities of Shakespeare’s language, especially his verse, and above all, on the articulation of these texts as works that can be performed.